281. 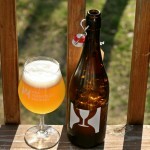 Hill Farmstead What is Enlightenment? Another pale ale from Hill Farmstead and this one is special as it was brewed for their second anniversary and uses a different mix of hops than Edward. The beer is lighter in color than the others from Hill but has the same cloudy appearance and white head. Aroma had tons of citrus and tropical fruits, very enticing and certainly draws you into the beer. The taste has more citrus and lemon notes than Edward and is excellent with a hoppy finish that makes you want more. I really cannot say enough good things about Hill Farmstead’s beers. They are everything I like in a beer; fresh, unfiltered with plenty of hops but not palate wrecking. Have a couple more bottles in the fridge and will get to them very soon. Brewers Description: American Pale Ale brewed in honor of our Second Anniversary. Simcoe and Amarillo hops.